Let’s get Environmental and Climate Justice now! In January 2015, the threshold of four of the nine planetary boundaries has been reached beyond whichhuman existence could end up threatened. 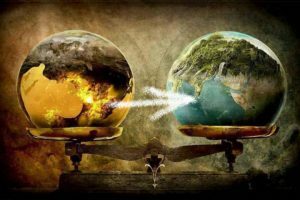 The period of stability experienced by our ecosystem for 10,000 years and is the cause of human development is endangered since the advent of the industrial revolutionwith, among others, the massive use of fossil fuels and progression of industrial agriculture. How to live for generations to come? It is time to recognize that the safety of the planet is a universal overall value to be protected, and that this requires to maintain acceptable living conditions for current and future generations. Our right to a healthy and sustainable environment has not been recognized as a fundamental right and it threatens the interests of transnational companies trying to sabotage the climate talks. In recent work fiercely for new free trade and investment agreements and the WTO policies, the IMF and the World Bank set up a legal framework granting them unilateral protection including the right to sue governments for the actual or supposed loss of profits, or the right to require changes in environmental legislation. How to reverse this trend? How to stop the most polluting activities that disrupt the climate and the biosphere? Can we impose to abandon fossil industry on behalf of the safety of the planet? Impunity leaders of transnational corporations or governments must be lifted in the most serious cases of destruction of living conditions on Earth. Yes, it is possible ! International criminal justice exists, we must all ask to adapt it to environmental and climate emergency. We all need the international crime of ecocide to be recognized. The experts of End Ecocide on Earth have prepared draft amendments to the Statute of the International Criminal Court (ICC) to add to the list of the most serious international crimes: genocide, crimes against humanity, the crime of aggression and war crimes, the crime of ecocide. Support this project to launch a strong appeal to States Parties to the ICC who have already this proposal in hands. Most of these countries are developing countries that are already victims of climate change and often are at the mercy of transnational corporations. Ask them to symbolically bring the text to Mr Ban Ki-Moon at the COP21 in December 2015 in Paris. It requires only one state to launch an ICC Statute review process. He must send the proposal to the Secretary General of the United Nations who will be in charge of convening the Assembly of States Parties to deliberate.